The varied selection of bases for the Plastic Chairs by Charles and Ray Eames makes it easy to find the right model for a wide range of locations and situations. For instance, the Pivot Side Chair Cast Base on Castors (PSCC) is ideal for home offices. 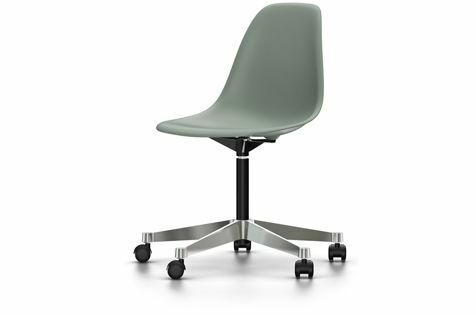 Thanks to the organically shaped, swivel-mounted seat shell with shock-absorbing suspension and continuous height adjustment, the chair ensures superb comfort. Five-star base in polished die-cast aluminium with double castors in basic dark.